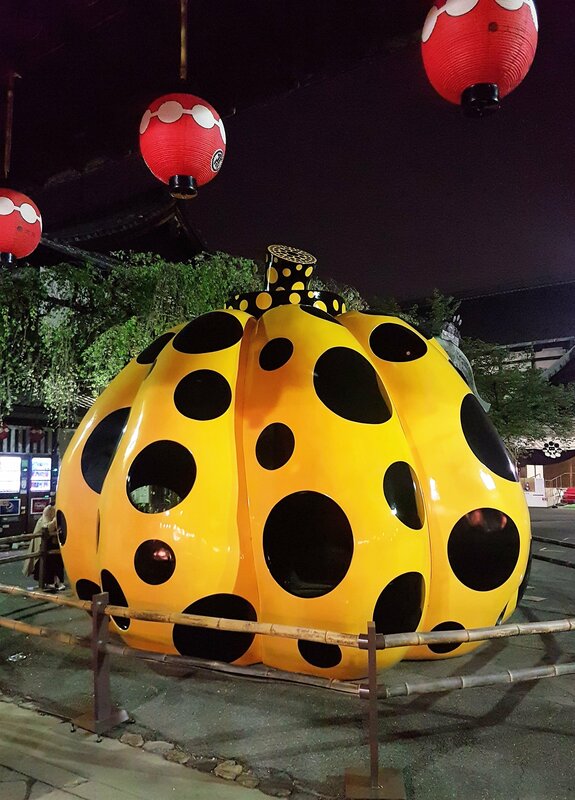 I’m including Kyoto, Gion, Geisha and other “forgotten” bits and pieces in this blog post. It is going to be a jumble of all the ad hoc things I haven’t included in my previous posts; the. I could have incorporated some/all of these the topics into my previous posts, but that would have made them even longer! In between all of this, I had to move hotels again. 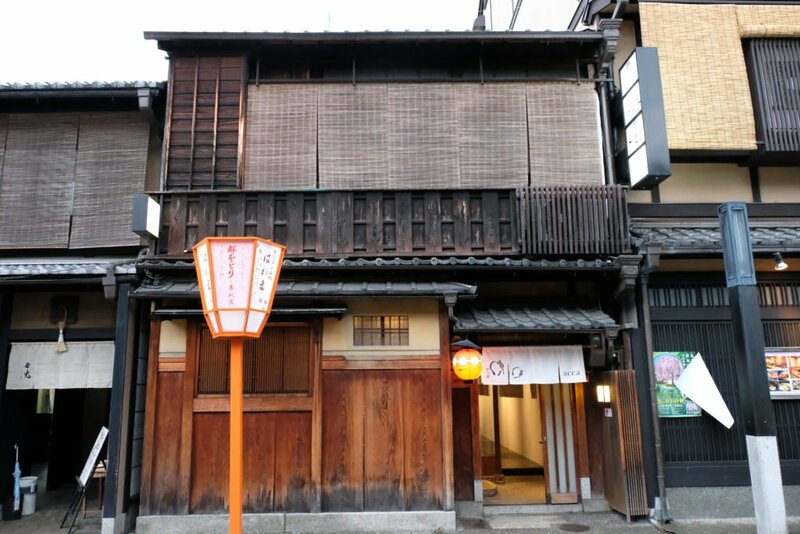 Luckily, Kyoto Inn Gion has a sister hotel only a few hundred meters way, aptly named Kyoto Inn Gion the Second. I underestimated how popular Kyoto is, with Kyoto Inn Gion fully booked hence the forced moved. My new location was even better than the first (second in Kyoto), and there was nothing wrong with the first. 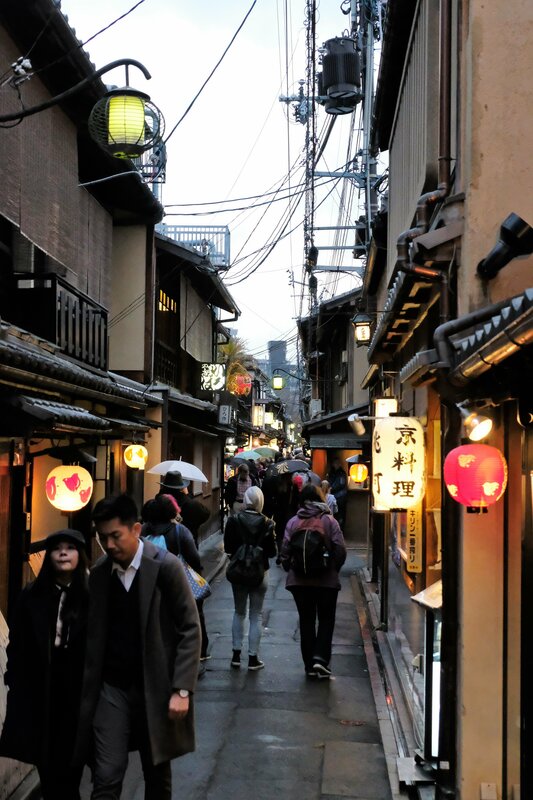 I combined my last two full days in Kyoto into one post, Kyoto – Bamboo Forest, Kinkaku-ji, Fushimi Inari Taisha, take a look if you like. I must give a shout out to the hotel staff at both Kyoto Inn Goins. Moving can be a chore, as I was moving to their sister hotel, I didn’t need to do any paperwork at all. Seems trivial, but it’s the little things that count. Adding to their efficiency they were always super friendly, and helpful especially when I asked for help or clarification with my enunciation. 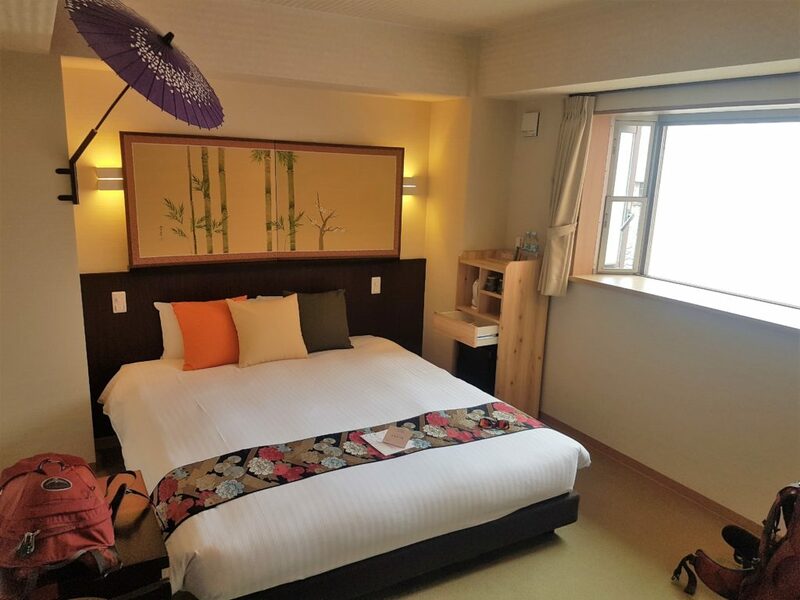 To top it off the sister hotel’s room was much bigger, the biggest I had had in Japan. A big room is never high on my list of priorities still, a little more space is always welcomed. 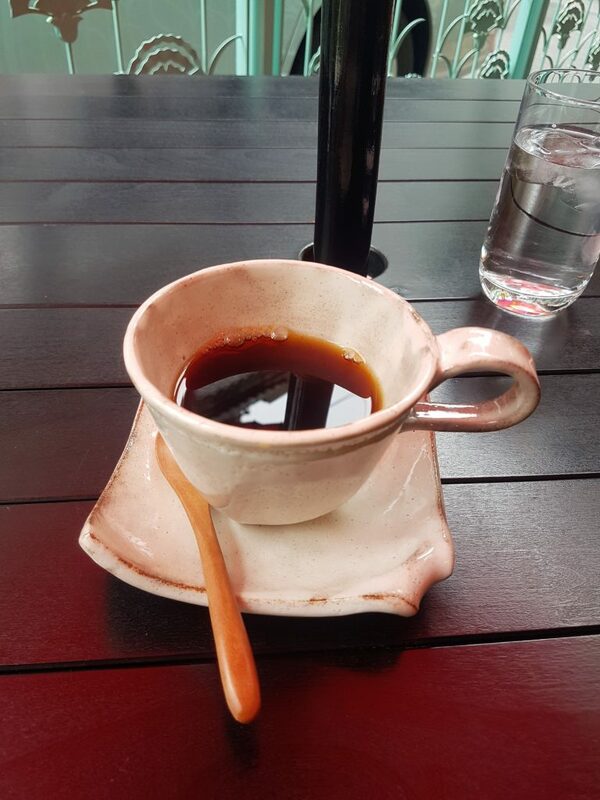 My morning coffee in an artisan cup and saucer – Kyoto Inn Gion the Second. 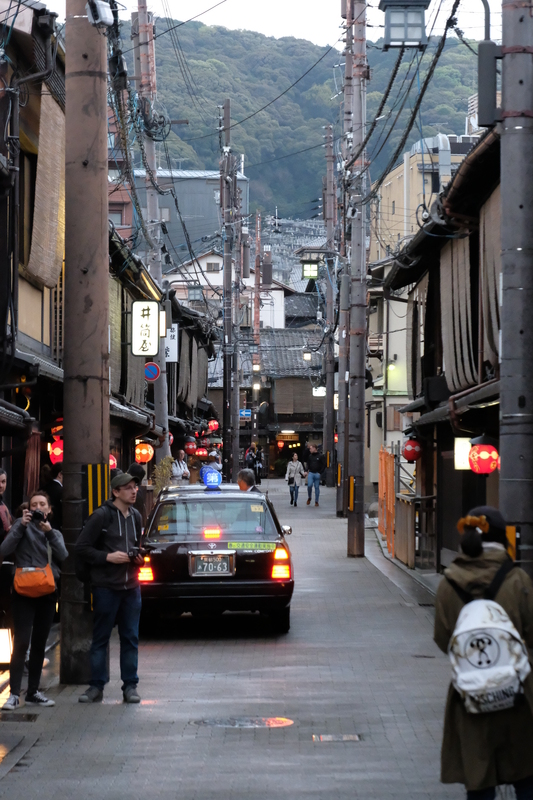 Kyoto is a cool city with something, or maybe that’s just me…I doubt it though. The outer areas are packed full of shrines and temples, especially at the bases of the mountains, no matter which direction. Thinking about it, no matter where you are in Kyoto you are never far from a temple, shrine or historical site. I cannot tell you how many places I walked past that in the very least I would have loved to poke my head into. 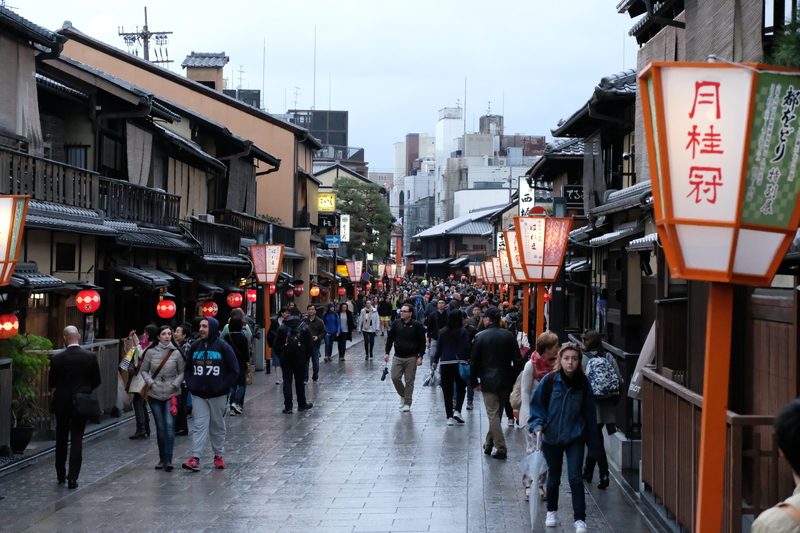 In the city centre Gion, Shinkyogoku-dori Street and Pontocho-dori were by far my favourite areas. Gion – Crossing the Kamo River you could be mistaken for thinking you’re in a different city. 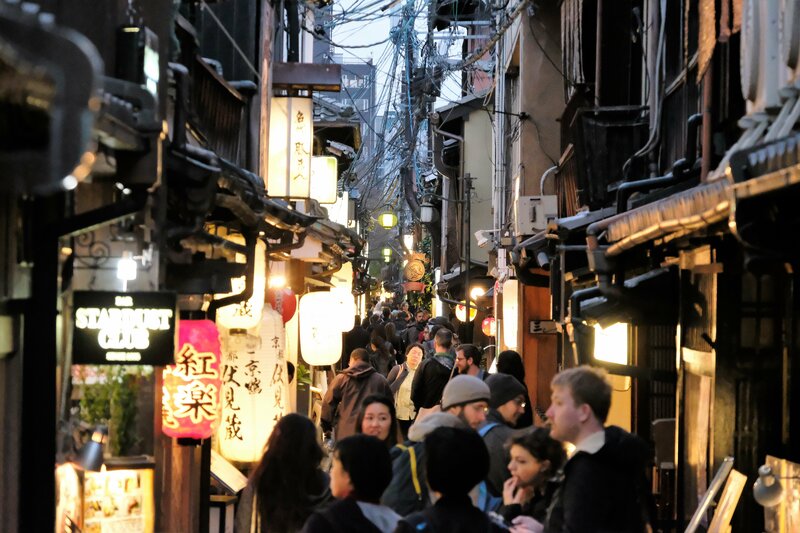 Filled with traditional shops, the heart of Gion still glimmers with the distant past. 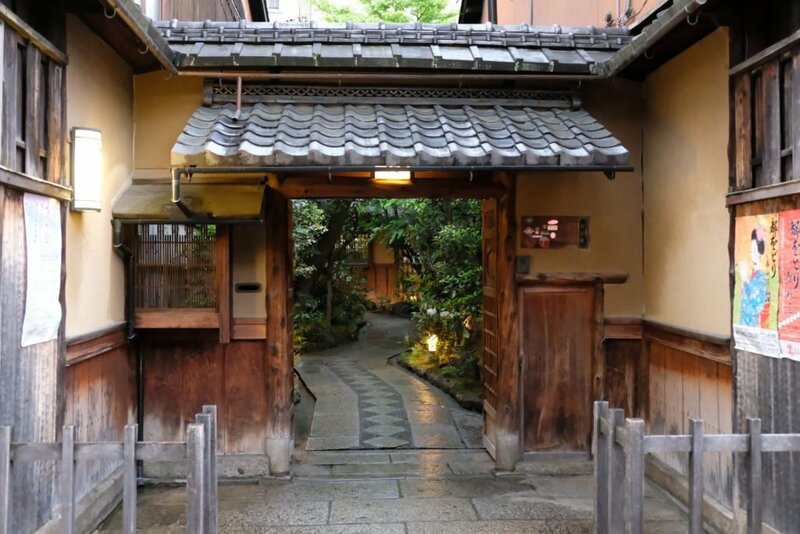 Gion offers up its best when you get of the main roads and into the narrow backstreets. 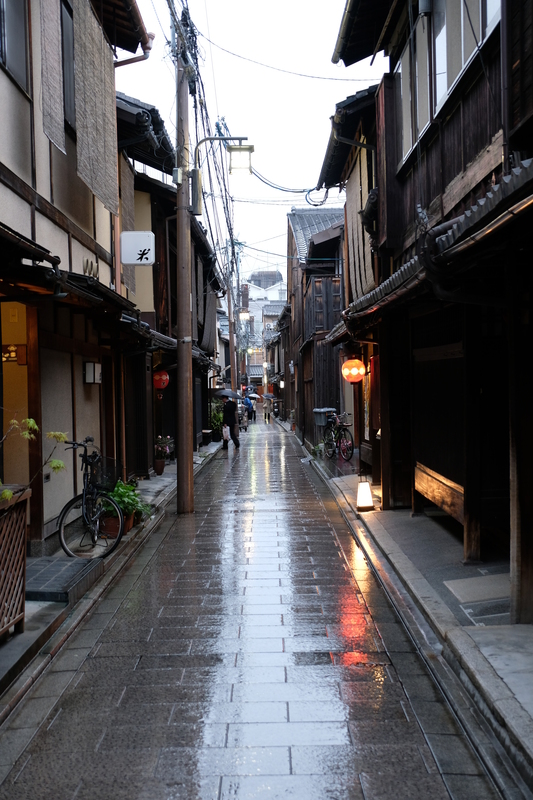 If you took away the paved roads, Gion is like taking a step back in time. 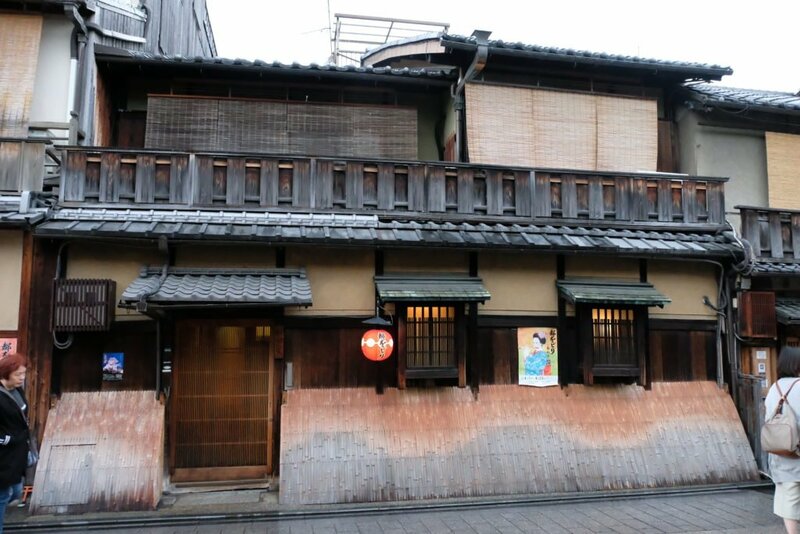 Wooden houses with bamboo fronts, I’m so glad I moved hotels, and lucky to have stayed in Gion for most of my time in Kyoto. 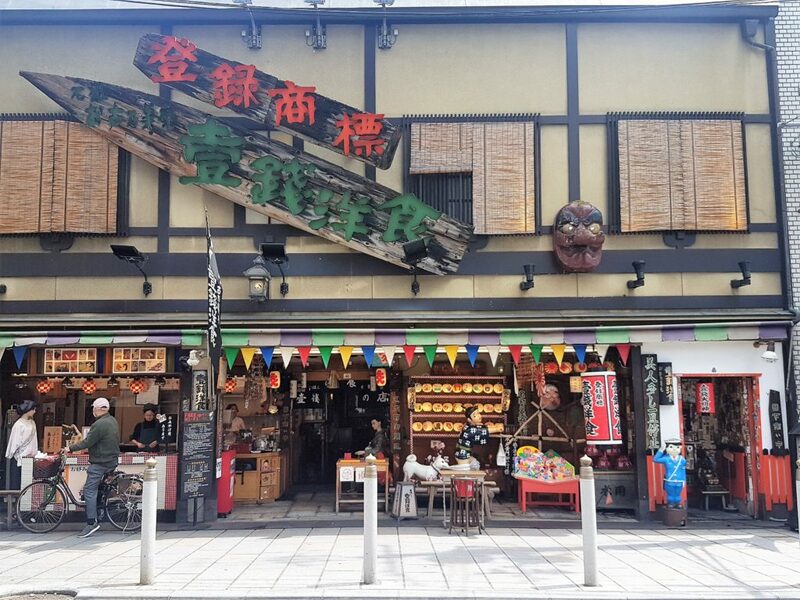 Shinkyogoku-dori – Not that shopping is my thing, but it’s a nice alternative to walking through the many malls in Kyoto. I’d say it’s a mix of market stalls with a few high street shops too, worth a visit or just a walk through. 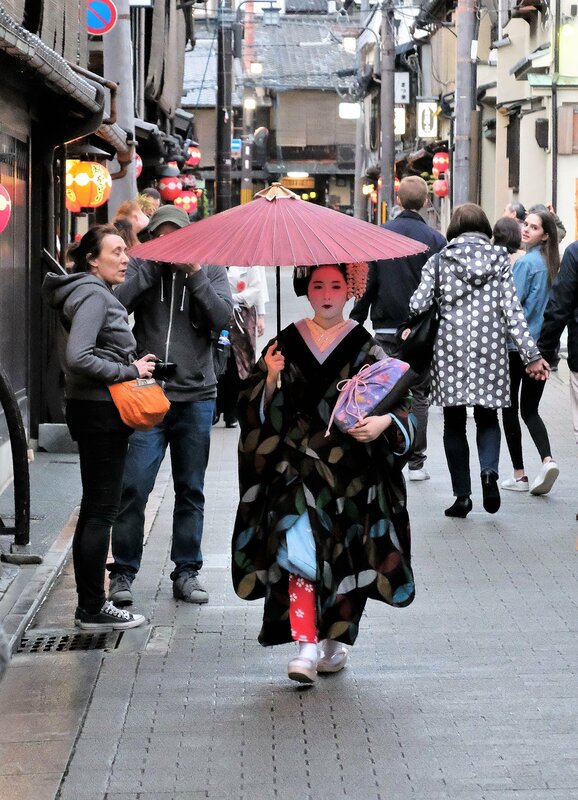 Pontocho-dori – Running parallel to Kamo River on the West side only a block from the river, this is the second-best place to spot Geisha/Geiko/Maiko. It’s a narrow road, more like an alleyway, packed with quaintness and authenticity. 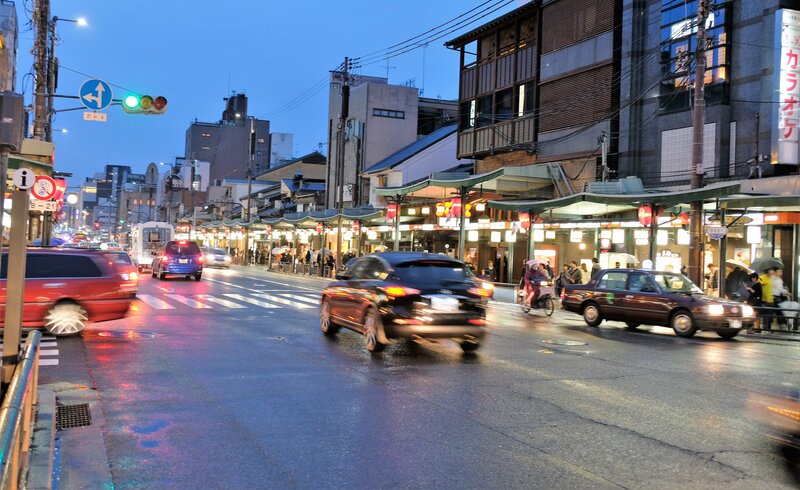 From curio shops to high-end traditional restaurants, it’s a great place to amble about at night. Most of the time people, including myself, mistake Maikos for Geisha/Geiko. There I was snapping away at Maikos thinking they were Geikos. 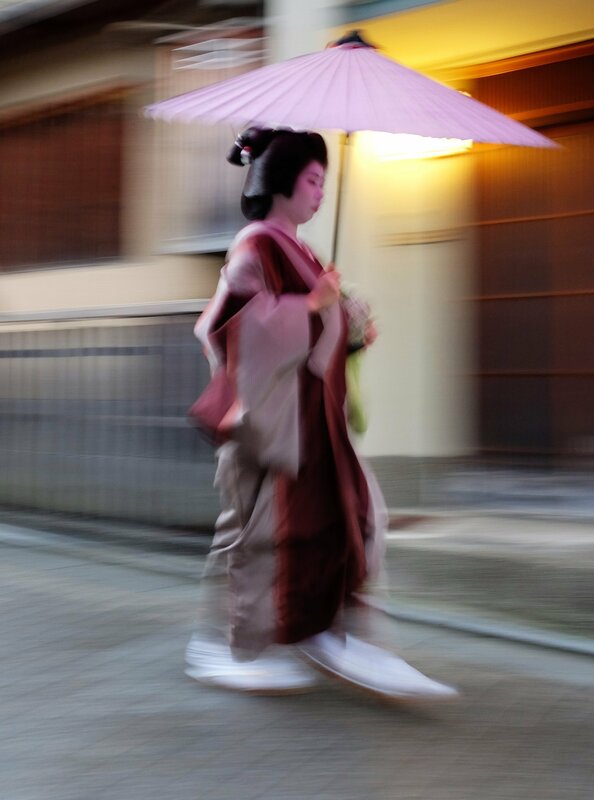 Whether it is true or not I don’t know, but Geishas are not often seen walking to work so naturally they are spotted less. During my search to capture them I only saw seven of them. One two occasions, a Geisha (not Maiko) was getting into a taxi. She was too far away, with it happening so suddenly I didn’t get the chance to take a picture. 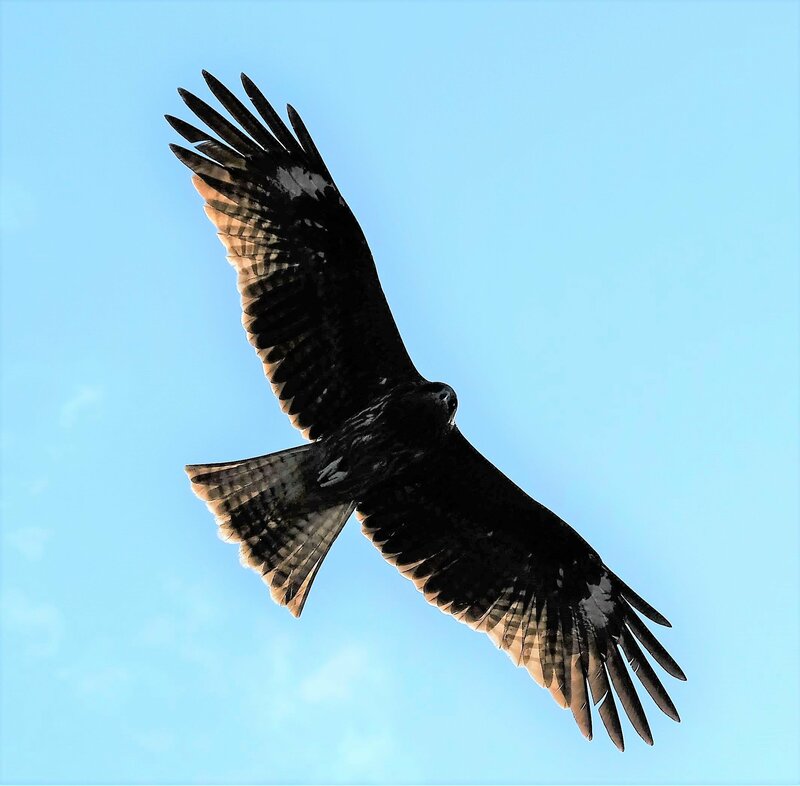 Another two occasions I say Maikos at a distance, then disappearing into buildings, again I was too slow. Two things I observed when out looking for Geishas. Firstly, they walk silently. You would think with all that clothing and those shoes they would make a noise, not at all, they are as stealthy! Secondly, they walk bloody fast! Living in London I learnt to walk fast, but the Maikos and Geikos walk very fast. Considering how restrictive their clothing looks, and none that I saw were particularly tall, wow they move like the wind! Even as they speed through the street you cannot escape how elegantly they do so. It’s the Kyoto Traditional Musical Foundation with the show broken into seven segments. Each different, with a separate unrelated topic. Cost is ¥3150 per adult, but they do have group discounts. I tried getting in twice, on the first occasion the queue was so long I decided not to go. A tip from the hotel staff was to get there at least 1 hour before the show starts; they have a limited number of seats meaning it’s first come first served. The whole show only takes 50-60 minutes, something I would recommend going to see if it fits your budget. Chado / Tea Ceremony – Watching any skilful craftsperson is interesting, and that’s exactly what the tea ceremony is all about. 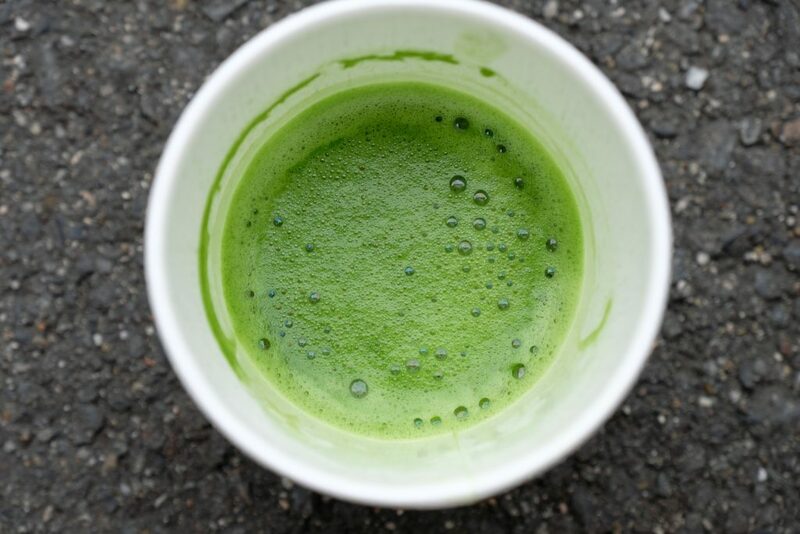 Tea tasting was brought to Japan by Zen Buddhist priests during the Heian Period (12th Century). A sombre ceremony yet intriguing, and embodiment of Japanese culture; striving for perfection, purpose and beauty even in the most mundane tasks of life. Koto / Japanese Harp – A unique sound that reverberates the soundtrack of ancient Japan and China. An eerie soulful resonance that penetrates the heart and mind. It echoes and yearns for the past and found the sound to be solitudinous. Gagaku / Court Music – More of a theatrical performance with traditional music, Gagaku means “elegant music”, but includes dancing and singing. Originating in China circa. 7th century it made its way to Japan in the 8th Century, slowly fading out of popularity in China. Today it can be classified as authentically Japanese. Kyomai / Kyoto Style Dance – Performed by a junior Maiko and Maiko, I enjoyed this part of the show the most. Maybe not for the reason would think…finally get close to a Maiko without them zooming past me with their quick little steps 😊. They perform a traditional dance using slow, graceful and elegant movements done with precision and purpose. The performance was moving and emotional, to me it had a tinge of melancholy. I’d like to see more Japanese traditional dances, very interesting. I’ll leave it at that. Bunraku (Puppet Play) – Watching it made me reminisce of the puppet shows I saw in Vietnam (Hanoi and Hoi An), without the water. I suppose it is the equivalent of watching a short Shakespeare play. With an underlying story parallel to true accounts hundreds of years ago. Like Romeo and Juliet, two star crossed lovers have a wedge forced between them by a protagonist. In the end they are reunited to kindle a love which is shunned by society. 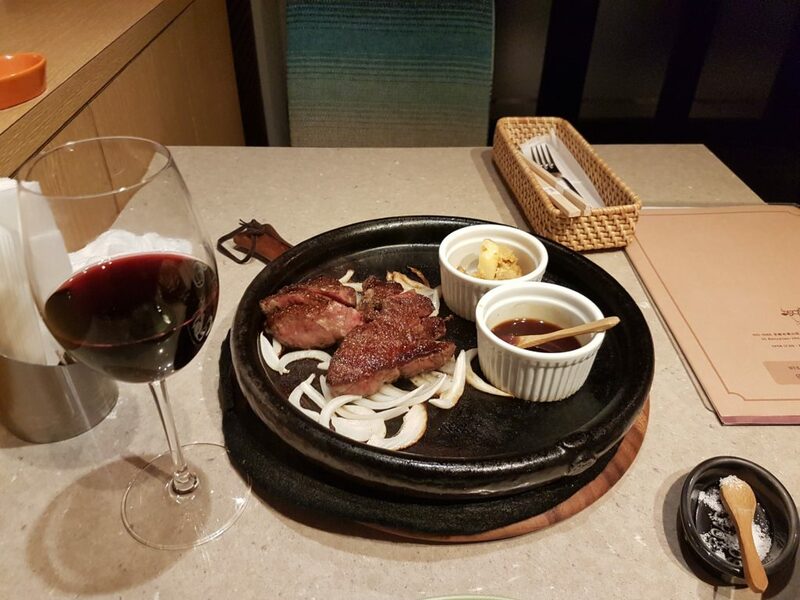 If you like steak then Japan is the place for you, especially Kobe and Kyoto. It’s not just the top-end restaurants that get booked up, they all do! There is a restaurant to match everyone’s purse strings, I opted for the middle ground. With a plethora of restaurants to choose from, I sought the advice from the hotel staff at reception. Always happy to help, they suggested a restaurant called 1596, called and book a table for me. I’m pretty sure 1596 is not the Japanese name for the restaurant. For some or other reason I struggled to find the address when writing this, however this link will take you to it (address for 1596). 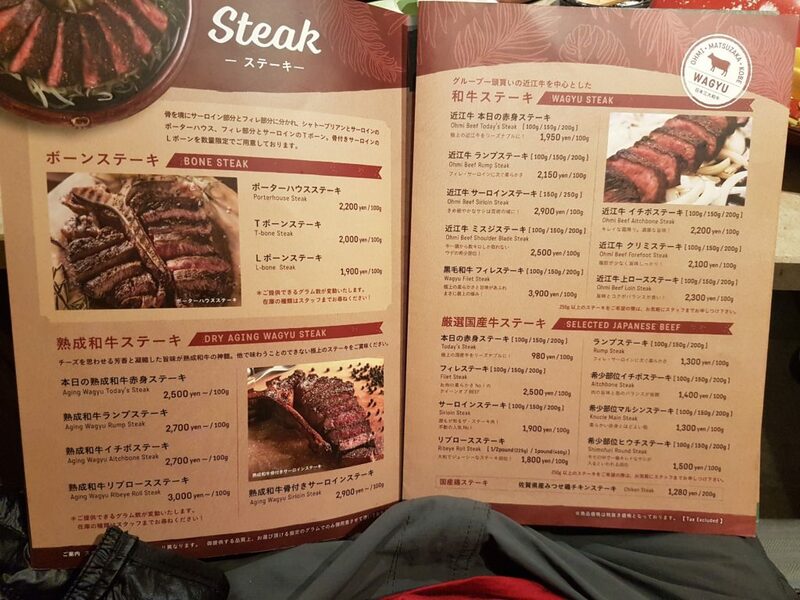 It goes without saying, the menu for steak is quite extensive and the results was a meaty meal I had been craving! Easily in the top 10 best steaks I have ever had, the glass of red wine (two) went down just as well too. At first, I thought the waiters were not very good. I kept looking up to grab their attention, except they seemed to be ignoring me. Only after watching the people next to me did I have my eureka moment, silly me! Waiters here leave customers alone; my guess is they see it as intrusive. If you want help/service, you call them. I doubt whistling or clicking your fingers would be accepted, but a respectful call out is all they need. Once I adapted the service couldn’t have been any better – though at first, I was a little embarrassed. Personally, I much prefer the Japanese style. You get to eat in peace, without someone constantly coming over to ask you how the meal is…invariably when your mouth is full of food. 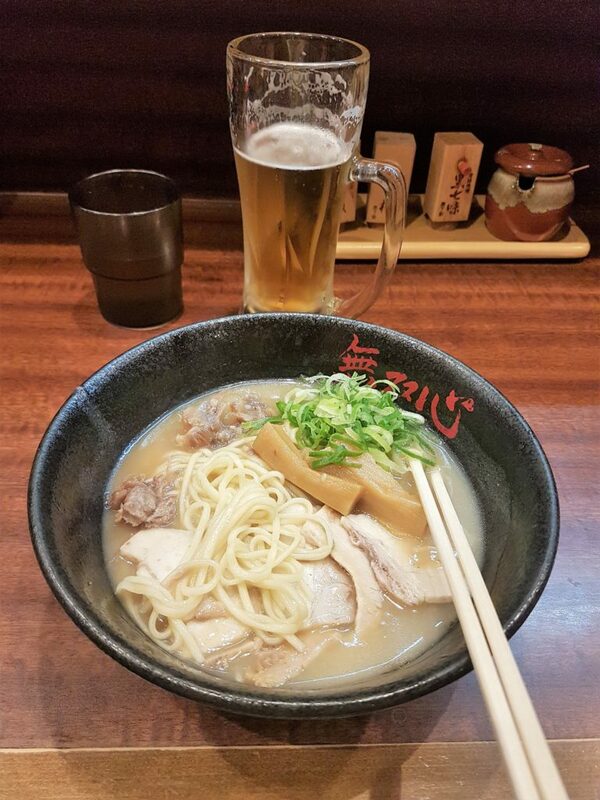 Again, another recommendation of my hotel, a soup and noodle restaurant called Musoshin; around the corner from Kenninji Temple. Considerably cheaper than the steak restaurant, yet just as tasty and a different experience too. 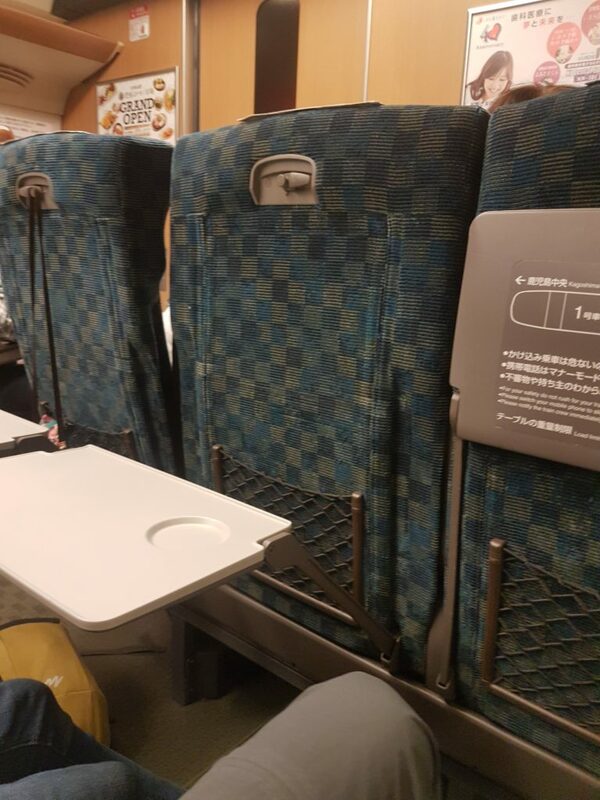 As a rookie to Japan I didn’t know what to do when I arrived. It’s a very small restaurant, more like a café in size; with only two employees, including the chef. In order to make a convoluted story succinct I’ll summarise. 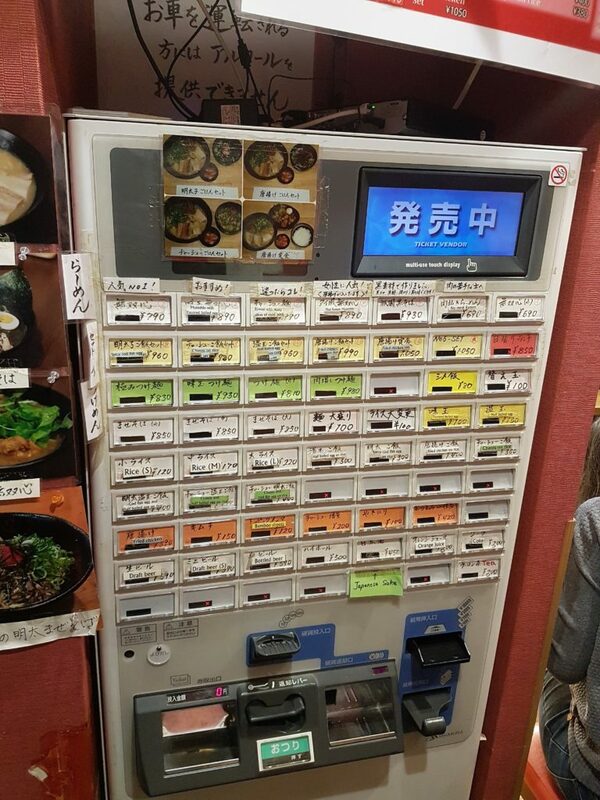 Before taking a seat there is a ticket vending machine at the entrance; you select what you want, including drinks, pay and it prints out your order and receipt. You give this to one of the employees when you sit down, and they get one with preparing your food. If you want something else, you go back to the ticket machine and repeat the process; you cannot order &/or pay to anyone. To make things more interesting, the ticket machine is entirely in Japanese, except for rice. The confused look on my face caught the attention of the non-chef, thankfully he helped me order. There were a few pictures of dishes that looked interesting, I pointed to which one and he in turn showed me which buttons to press. For the price, and I honestly cannot remember how much it cost, it was a full heart delicious meal (and beer) and cheap! I ate at a few other places, a suchi restaurant which was fantastic, just cannot remember the name. Another restaurant was just like eating at a family member’s house, not far from the hotel too – heap as chips! 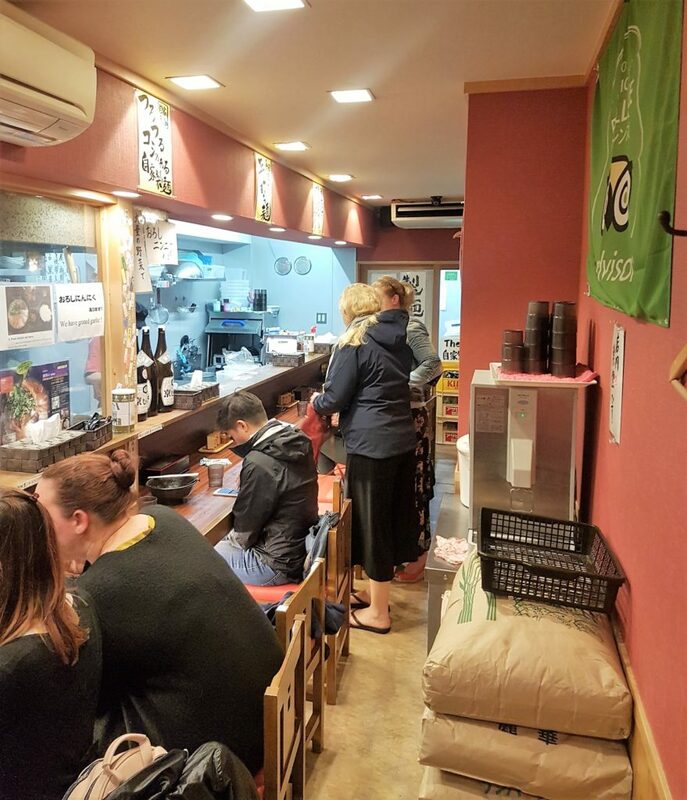 Although Kyoto (Japan as a whole) is expensive there are many cheap ways to eat out without breaking the bank. Looking back, I can’t recall every having a bad experience with the restaurants or food. Ah yes, almost forgot! 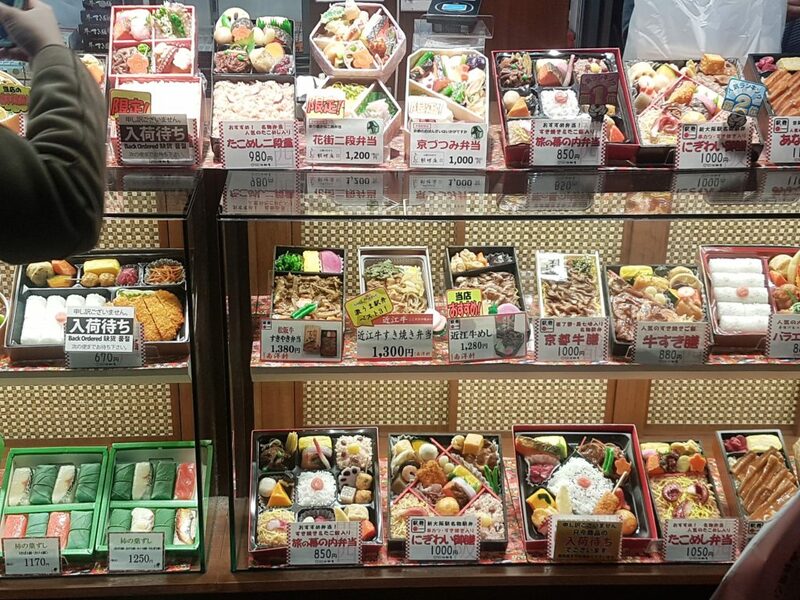 Many restaurants have window displays of their food. Only thing is, the displays are plastic moulds! Most of them look extremely realistic, they can really help know what food is sold without needing to read Japanese. 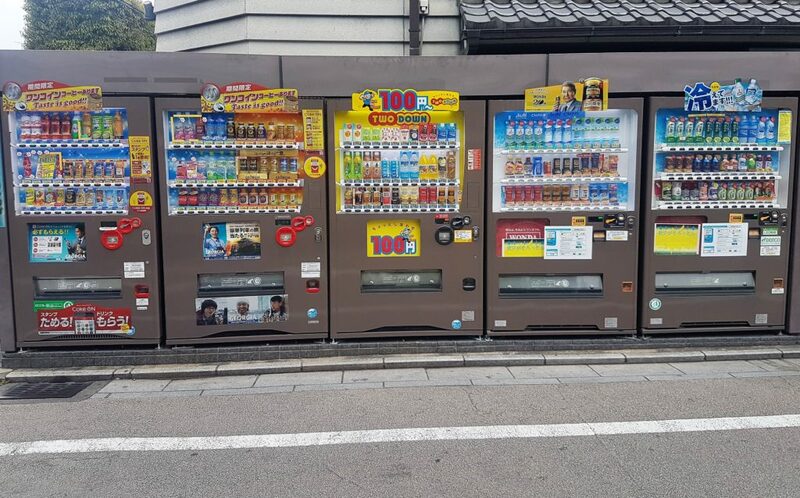 Kyoto and Tokyo are full of vending machines one the pavements/sidewalks. Tokyo surprised me by the sheer number of them, I reconciled this with the fact of it being such vast and populated city. 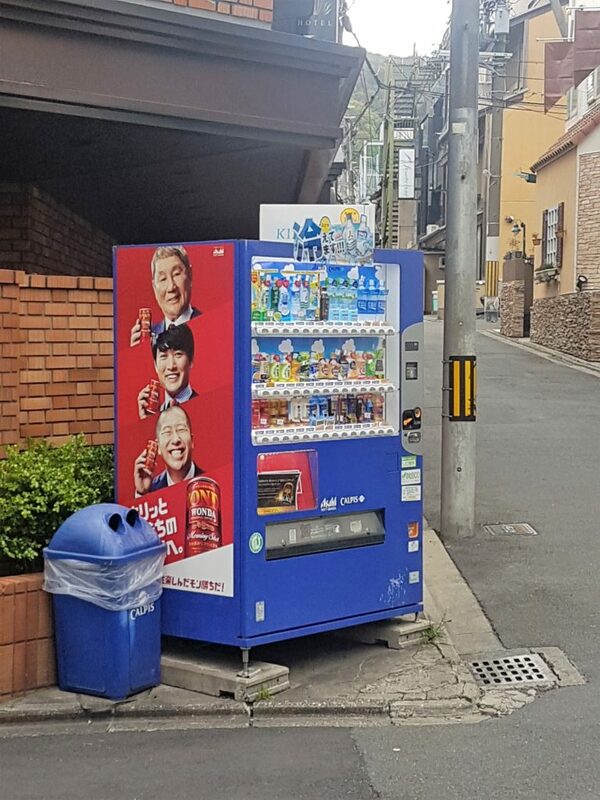 Seems vending machines are the norm, with Kyoto no different. 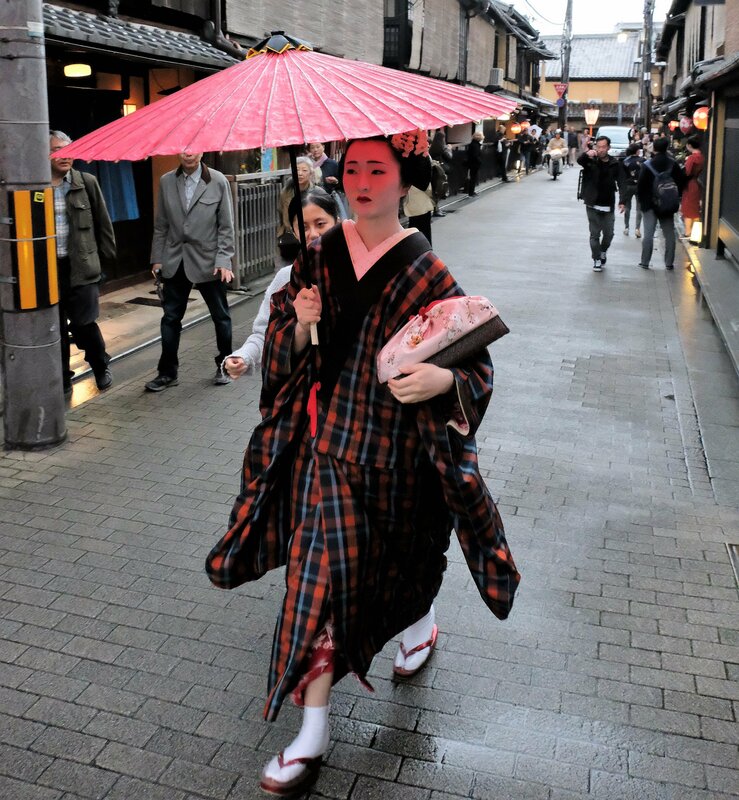 In Gion they seem to stick out like a sore thumb. 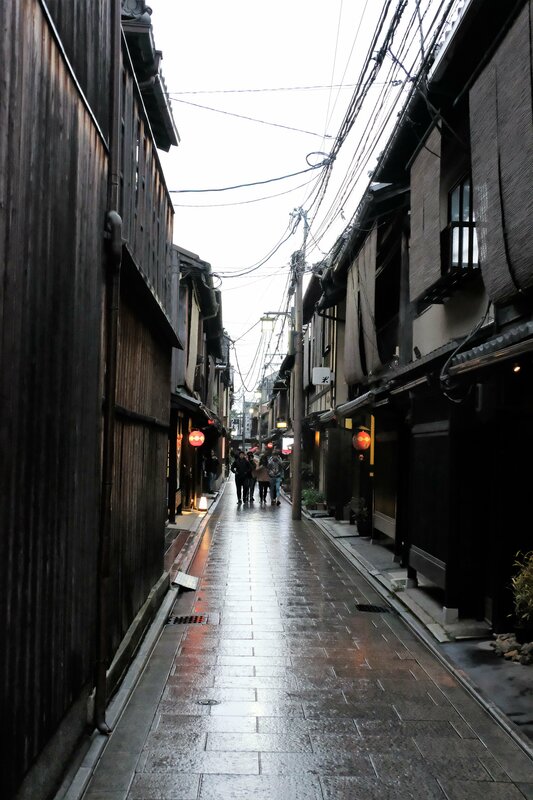 Gion for most part is very traditional, from restaurants to architecture. 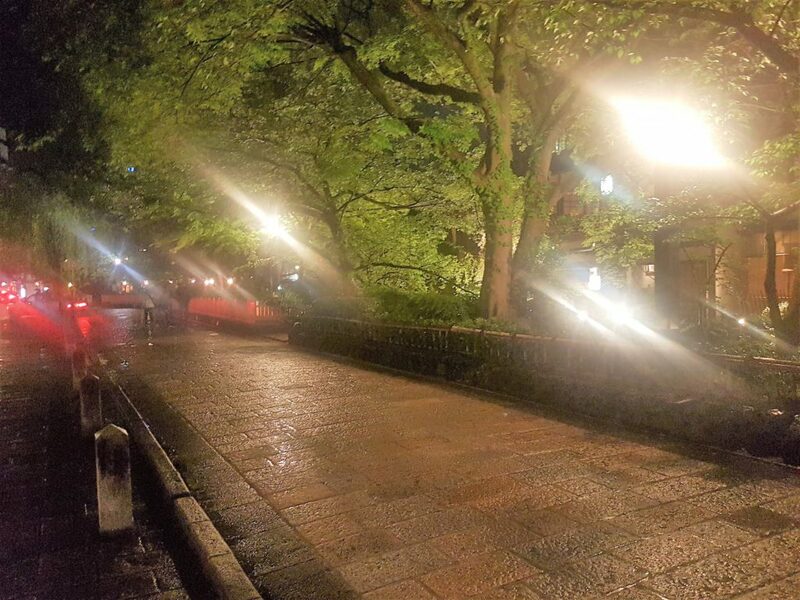 It even has a different vibe to the West side of Kamo River. Anyway, I just found it interesting at the number of vending machines, most of which sell drinks…of any and every kind you can think of. Why so many vending machines, I don’t know? It’s not like there aren’t any shops around, and with so many machines it’s unlikely you’ll die of dehydration from one road to the next. Another quick shout out and thanks to Koichi Ikemoto, the owner of Yoshida Barber shop Kewpie. 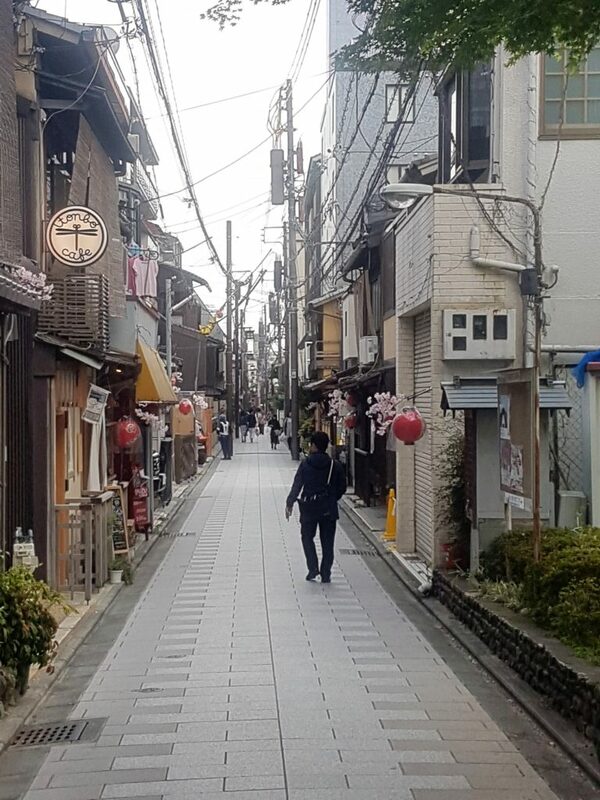 Around 100m from my hotel at 434 Minamisaikaishichō, Higashiyama-ku, 東山区 Kyōto-fu. A real Japanese barber with a Rock ’n Roll/Rockabilly styling. Koichi was super cool, his English considerably better than my Japanese, which is near nonexistent. Even so, he cracked up a conversation and the haircut results were excellent, even if I say so myself. No, I didn’t take a photo, pity. You may have guessed I’m not one for selfies, a shame not to have shown off Koishi’s stylish work. Thanks Koishi! 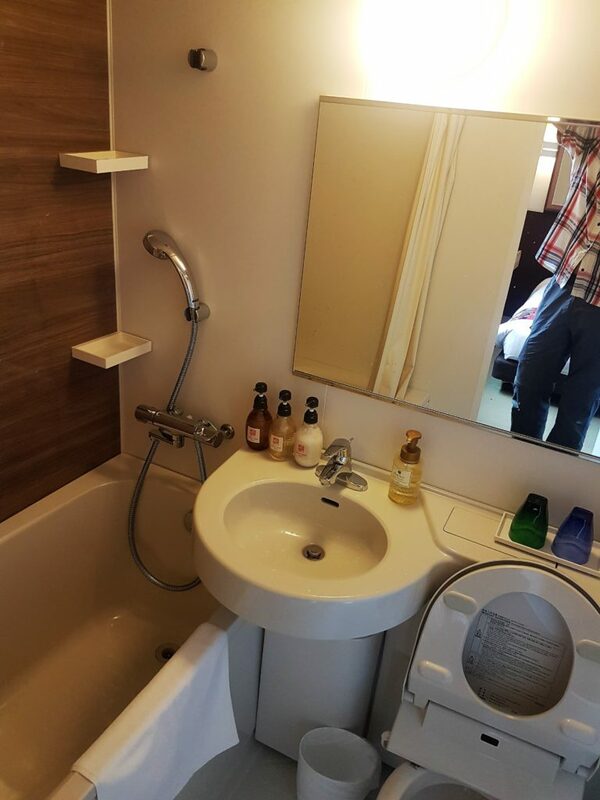 I imagine it’s not to often to have a section in a blog about toilets. Come to think of it if I include all my experiences, I could easily write a whole blog post on toilets. Don’t worry, this will not be a crass paragraph. I’ve included the photo below, which was the simplest toilet device. From heated toilet seats, different types of sprays and strengths, they do almost everything. I even had one that blows air (various cool to warm settings) to dry you off instead of using toilet paper. At my first hotel in Tokyo, the toilet must have had close to 10 buttons! That, along with Wi-Fi and power to plug your phone into…why leave the bathroom at all! 😊 Ps. at all my hotels in Japan the bathrooms mirrors were heated so they don’t steam up, love that! Arriving in a new country or city can have its challenges, especially if the local language is different to your own. What can exacerbate the anxiety, is if the written language has no resemblance to your own. 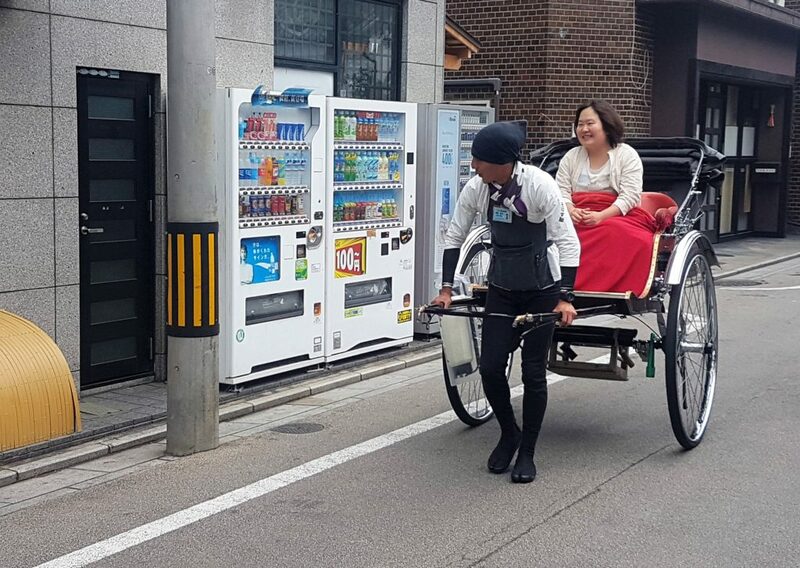 Getting around Japan was a doddle, I’d go so far as to say pleasurable. Google Maps is a godsend, but if your mobile/cell phone doesn’t work overseas it doesn’t matter – mine was. My hotel was always willing to help &/or give guidance and suggestions. The JR Pass was definitely cost effective for me. Had I not bought one my travel would have been close to double what I paid! The customer service and help from staff at the Metro’s were always very helpful, the language was never much of a problem. And, within the major/large towns/cities the signage is in Japanese and English. 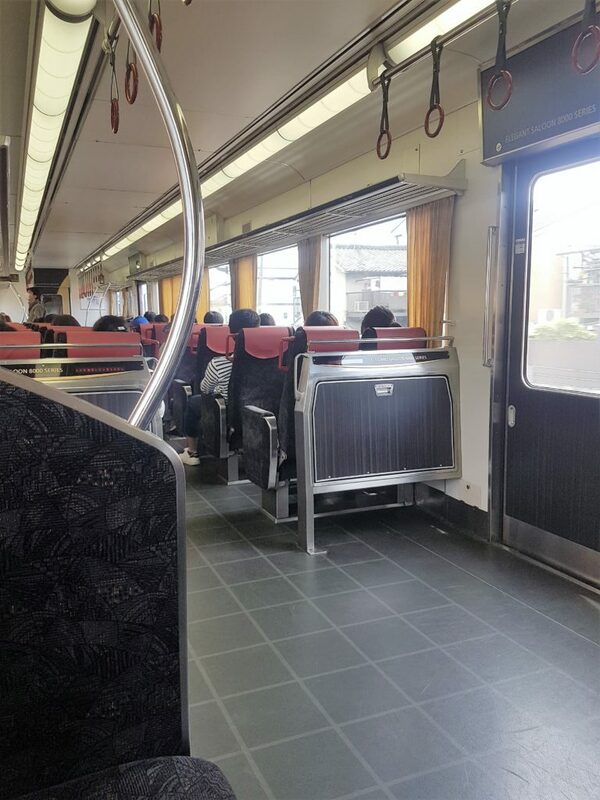 I think I many have mentioned (a few times 😊), that the busses, trains and Metro’s are spotless – the cleanest public transport I have ever used. On one occasion I got onto a bus on the wrong side of the road, really no harm done, losing 30 minutes of my day…hardly the stuff to write about. For me there were only two disappointments in Kyoto, firstly the Manga Museum and secondly the Samurai Museum. Samurai Museum – It’s not a museum per se. I’d say it’s more like a tourist attraction, where you can dress up in samurai clothing and get your photo taken. I was very keen to find out more about the samurai, finding it odd there was little to nothing to accommodate it – except for the “museum”. 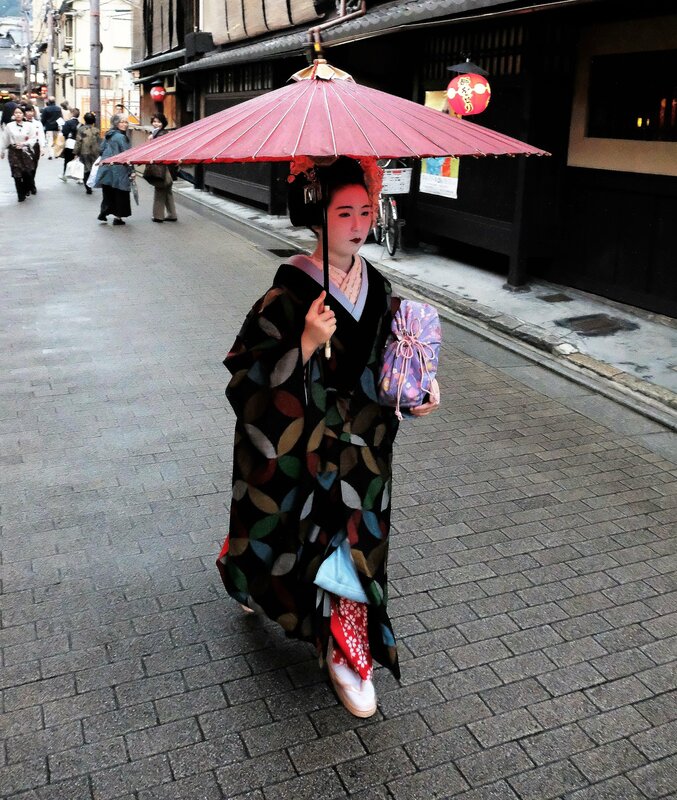 That’s the end of my mix-match Kyoto blog post. I know the photos are not cool or unique, but they hold fond memories for me. Sure, seeing the popular sites is great fun, yet it’s all the little moments that are special and leave a lasting memory. Kyoto was awesome, I thoroughly enjoyed every minute, just wished I had seen more. I learnt loads about Japan, the Japanese people, their history and religion, but only scratched the surface and would love to learn more.